Do you remember the Y2K bug, the computer programming flaw that threatened to reset the digital world to the year zero at the turn of the century? Hospital life support systems might stop. Planes might lose navigation. Everyone’s bank accounts might reset to zero. The issue surfaced in popular culture in the mid-1990s; it reached fever pitch in the 12 months leading up to the new millennium. And then on New Year’s Day 2000 … nothing. Phew, that was close. Just as well governments and big business invested millions if not billions in consulting advice to correct the situation. Here was a looming calamity that only geeks could understand. Our job was to comply and to pay up so as to avert disaster. But I am of course being unfair to the peddlers of Y2K calamity — they were simply feeding the natural market for fear of the future. Why, no sooner had Y2K receded than the threat of pandemic via avian flu and then severe acute respiratory syndrome was scaring us witless. Same modus operandi as Y2K: credible narrative that only geeks can understand. It’s all so terribly empowering for geeks. Y2K was very real. The effects were real, but mostly averted — precisely because it was taken seriously. So what was the Y2K bug? It’s not a problem that, as Mr Salt claims, only geeks can understand. 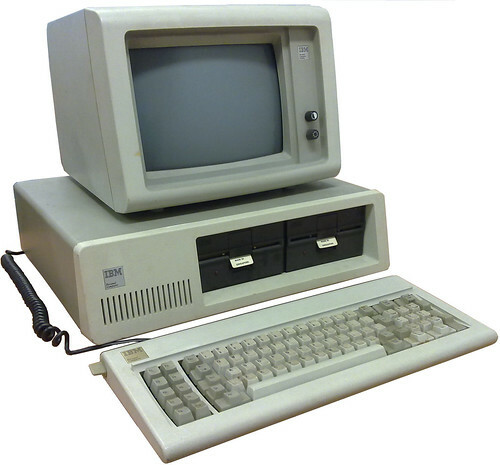 By the late 20th century, computerisation was becoming commonplace. Because it was common for people to write years as two digits, and computer memory in the 70s and 80s was scarce, and forward planning wasn’t great, it became common to write computer programs to use two digit years; to assume that the year was 19xx. By the late-1980s, it was clear that ticking over into the year 2000 would be a problem for those computer systems using two digit years. It was drummed into us when I started my IT degree in 1989 that many of these systems would still be around in the 21st century, and they had to be written to take dates beyond 1999 into account. A simple example: To calculate how many years since one was born, calculate the Current Year minus Birth Year. For me in 1995, this was 95 – 70 = 25. Easy. But what happens in the year 2000? 00 – 70. Either the computer would stop with an error (software can be a bit delicate, and prone to just stopping if something unexpected happens) or it might conclude that my age is minus 70. It was blindingly obvious that with so many systems out there at risk of not coping with the year 2000, something had to be done. It was widely recognised, and acted upon. In many cases it wasn’t really known what would happen, so a lot of testing occurred to show which systems were Y2K compliant, and which were vulnerable. Put in logic that said anything between 00 and (say) 49 was to be treated as 20xx rather than 19xx — easier in some cases, but this would cause problems with birth dates in particular, for older people. It also means the problem isn’t really fixed, just deferred. Of course any of these activities involves a lot of testing to make sure it all works. 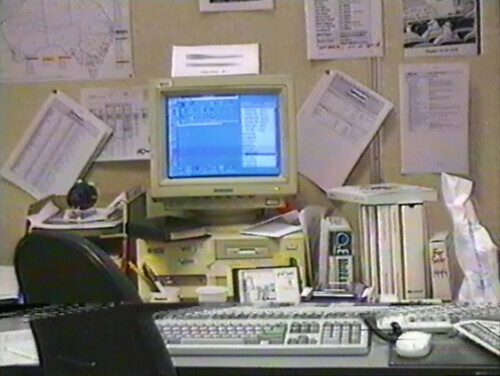 In the late 90s I worked at a company whose software was mostly written in the early-80s, running Point Of Sale and back-office operations for thousands of Australian service stations. They considered rewriting their applications completely, which would have had the benefit of moving from old DOS/character-based interfaces to a more modern Windows graphical interface, but they are hugely complex applications, and there wasn’t time. Right across the IT world similar activity was happening. To their credit, big companies (often with the oldest, most trouble-prone systems) worked the hardest to avert a problem, knowing that if their computers fell over in January 2000, it could have significant economic impact. A few (especially smaller) organisations largely ignored the Y2K problem, or just hoped it wouldn’t cause major issues. But most either replaced or fixed their systems. So what happened in 2000? Despite some panic beforehand, most of the big and important systems kept working more-or-less to plan precisely because the problem had been recognised and acted upon. But some systems either failed in non-critical ways, or produced slightly odd results. Here’s a documented minor example: in early 2000 I received an insurance renewal notice — from a small insurance broker — advising me to start paying from March 1900. But mostly the problems were only minor and/or amusing. Individual computer systems have the potential for similar failures due to data fields overflowing. For instance a system that uses a unique number for each transaction but only allows ten digits could have problems after they tick over from transaction number 9,999,999,999. Some systems track dates by seconds from a specific date, and those fields could overflow in the future — for instance on 19 January 2038, versions of Unix that use 32-bit time stamps will stop working. In his opinion piece, Mr Salt appears to be playing to The Australian’s conservative audience. Although he doesn’t mention climate change, he seems to be saying that because we can’t see the effects of Y2K, swine flu or peak oil, none of them were or are real, basically saying we should dismiss any doomsayers who come along proclaiming there are big problems ahead. The reality is we need to examine the evidence and be rational about it. Some problems are exaggerated, some are real. Some were real and were avoided. Y2K was one of those. The problem was not conceptually complex; you don’t need an IT degree to understand that if nothing had been done, there could have been big problems. Bach. of Computing (Information Systems), Monash University, 1992. Quite a good list of Y2K failures from 1999… with a bunch of ill-informed “hoax!” comments at the bottom. Let me briefly go through the mistakes in this opinion article from The Age today then I’ll get to the real point of this post. ”If it ain’t broke, don’t fix it”, goes the old adage. The claim in government circles is that Metcard is broke — at least almost — and needed significant investment to keep it running reliably. I don’t know if they’ve ever presented the evidence to that effect, but given regular cases of cards getting jammed in validators, there seems to be something in it. Actually the original plan was for Myki to include ticket machines on trams which would accept notes. It is unknown just how many people have been fined after boarding a tram holding a $10 note, only to discover that a $10 note – legal tender everywhere else in Australia – didn’t buy a tram ticket. Legal tender does not mean every business selling something has to accept every form of Australian currency. See: No, the law doesn’t demand that Myki accept 5 cent coins, or that Metcard machines accept notes. Picture this myki utopia: … so you simply whip out your phone, log on to the myki website and transfer credit on to the card, before touching on before the tram has even reached the next stop. 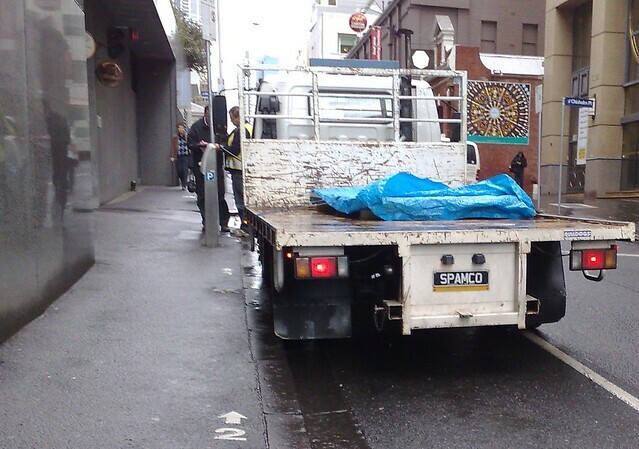 I wonder how he thinks the transaction gets from the Myki web site onto your card? Magic? Actually it gets transferred via wifi when trams (and buses) are in the depot… which is why they say it could take up to 24 hours. When you transfer funds into your card via the internet, you need to wait up to three days for those funds to be available. Myki themselves say 24 hours (although they hedge their bets and sometimes say “at least 24 hours”), though I’ve seen it work in about two hours. Until now, charities, community legal centres and other non-government organisations which provide services to people who are homeless or on extremely low incomes simply provided clients with daily Metcard tickets where the need arose. Now, they are faced with the prospect of providing a $6 myki card, plus fare, to each client for each journey. I’m not sure why he assumes those people would need a full fare $6 card. Aren’t they more likely to need a $3 concession card (provided they have the relevant proof, such as a Health Care Card)? In any case, as noted by The Age just last week, NGOs such as charities needing to pay for travel for their clients can use a paper Day Pass. The bottom of the article notes Mr Marks is a solicitor with the Victorian Aboriginal Legal Service — perhaps the Transport Ticketing Authority hasn’t approached them about this. I know the TTA has been talking to a lot of other NGOs on this topic — for over a year now. Later in the article Mr Marks derides the Myki Fares & Ticketing Manual for its lack of brevity. If he had read it properly, he’d have found on page 43 it details the Day Pass. As it happens, I’m a great supporter of the Manual. Every PT system in the world has a myriad of business rules behind it. The difference is in Victoria they’ve put it out in the open so anybody can read it. Kudos to the Victorian Government for this. 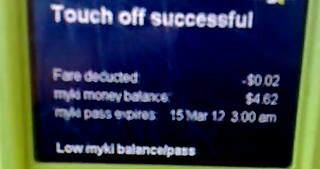 when they ”touch off”, users are not told the amount myki is taking out of their account. They are only given the balance remaining on their account. This is completely wrong. All Myki devices (apart from the old Metcard gates which are fast vanishing) tell you the current balance as well as the fare just deducted. On the bright side, at least he didn’t raise the 90 day myth. 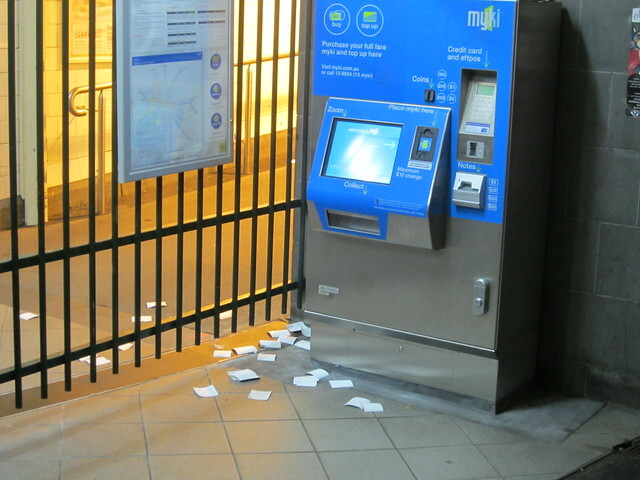 Myki has problems — some of them, such as the lack of a short term ticket, are really serious. Mr Marks raises this, but his point is lost in all the misinformation, which undermines the whole article. Myki is costing $1.5 billion over ten years, and the level of debate on this should be better. The real truth is bad enough. OK… next post tomorrow totally non-PT-related. Update Friday: Russell has posted a response to this blog post.